Sideline, supporters and staff kept themselves in check in the latter stages of the game, knowing the premiership was theirs but holding back the emotions until the siren had been sounded. The first quarter was an arm wrestle with the Tigers kicking an early goal through Cam Ilett and having momentum, before the Crocs steadied with Michael Mummery kicking a goal close to quarter time to see the teams deadlocked at the first break. The second quarter saw the Crocs keep their late momentum from the opening term, but were unable to hit the scoreboard. Nightcliff’s defence, the best in the league all season, just kept repelling the Crocs. Eventually the Tigers broke the shackles and kicked three goals to one for the quarter for a 14-point half-time lead. The premiership quarter, traditionally the period where flags are set up, continued to be a slog. Crocs kept staying in the contest in general field play, but the Tigers just wouldn’t let them score. Two goals to one for the quarter saw the Tigers go to the final turn with a now handy 21-point lead. Crocs would need to double their own score to break even and keep Nightcliff scoreless, but that was unlikely. Already this looked like a Nightcliff flag. The final quarter was no less enthralling, but every time Crocs tried to mount a challenge, the Tigers stood firm. Both teams kicked two goals for the quarter, with the Nightcliff Tigers holding out for an historic and emotional win. 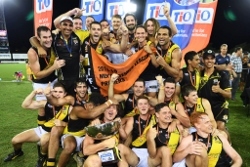 Liam Holt-Fitz was named the Cheney Medallist for best afield in the Grand Final as tear-streaked Tiger faces – players, staff and supporters alike – took in the emotion of a premiership.